Many companies that use palm oil are starting to realize the destructiveness of its cultivation and are committing to using only palm oil that is certified sustainable grown. Growers of sustainable palm oil are committed to ensuring that palm oil is grown responsibly on reclaimed land (rather than cut rainforest), preserving biodiversity, caring for workers, following all laws and regulations, having a “transparent” business plan and policies for oil palm growing, harvesting and production. 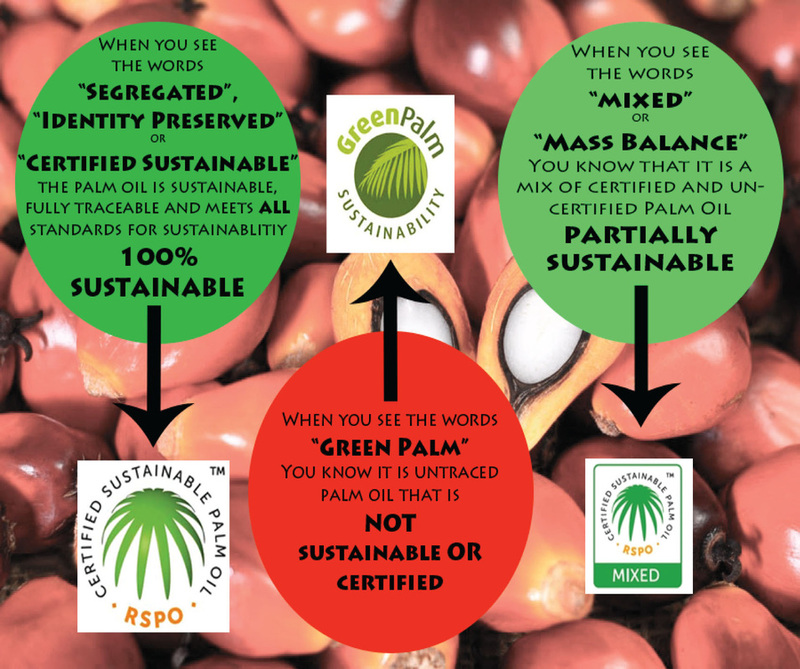 NOT ALL PALM OIL IS EQUAL! All palm oil is NOT created equally! Some labels trick consumers into thinking they are purchasing sustainable palm oil products. Learn what those labels mean to be sure you are purchasing certified products!